Do you experience clicking and popping in your jaw? Are you living with teeth grinding, neck pain, or other discomfort? If you answered yes to any of these questions, you may suffer from TMJ dysfunction. 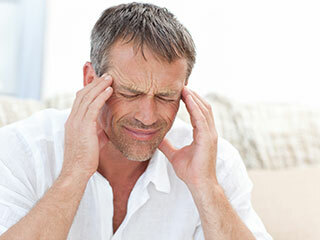 This painful condition, also called TMD, impacts an estimated 10 million Americans. At McComb Family Dental, our doctors want you to enjoy a healthy, comfortable smile. Your jaw joints, or temporomandibular joints, control the opening and closing of the jaw. These joints work in conjunction with various nerves and muscles to give you a complete range of motion. When the joints become misaligned, often from stress, injury, or fatigue, the associated nerves and muscles are strained, resulting in TMJ dysfunction. To accurately diagnosis TMJ dysfunction, your dentist will complete a full evaluation. Once she determines the cause of your problem, she will make treatment recommendations to address the issues and relieve your pain. We may suggest non-surgical therapies such as an oral appliance to prevent grinding and clenching, restorations to rebuild worn teeth, and strengthening exercises.